Edward II ruled from 1307 to 1325. He was the first English royal to be bestowed with the title of Prince of Wales. Edward II was also the first medieval monarch to be usurped. His reign saw England defeated by Robert Bruce at Bannockburn. His court saw unrest among the barons due to his promotion of favourites such as Piers Gaveston and Hugh le Despenser. Edward’s reign ended in 1325. Until recently it was widely accepted that he had been murdered. That view is now challenged by some historians. Edward II faced problems before his reign began. He had introduced his friends and favourites into the court of his father, Edward I. His approach to the court and his desire to see Piers Gaveston promoted was a cause of concern to Edward I and many of the barons. Gaveston was banished to Normandy, where his influence on the Prince would be lessened. Upon becoming King, Edward recalled his favourites to court. Gaveston was granted the title Duke of Cornwall. This title and the lands that go with it are usually reserved for senior royals. The barons were furious about this. They exiled Gaveston on two occasions. The barons also used the council, as established in the Provisions of Oxford, to limit Edward II’s spending and law making. In 1311 a set of Ordinances were introduced. The Ordinances took the Provisions of Oxford one step further. These new rules looked at financial matters, the Provisions had looked at law making. The country had financial problems. The wars in Scotland were expensive. The king was lavishing gifts upon his favourites. It was unaffordable and creating instability. The barons acted to prevent the issue becoming worse. The Ordinances changed the way that tax was collected. Instead of it being paid to the crown, it was now paid to the Exchequer. It is a subtle difference, but it has a large impact. The Exchequer is under the control of the council. It’s expenditure is held to account and determined by those men on the council, whereas the crown can, and did, spend it on it’s own interests. These Ordinances were forced upon Edward II by the barons, led by Thomas of Lancaster. Soon after, the kings favourite, Piers Gaveston, was executed by the barons. In 1314, with the barons still coercing Edward into doing their bidding, troubles flared once more in Scotland. 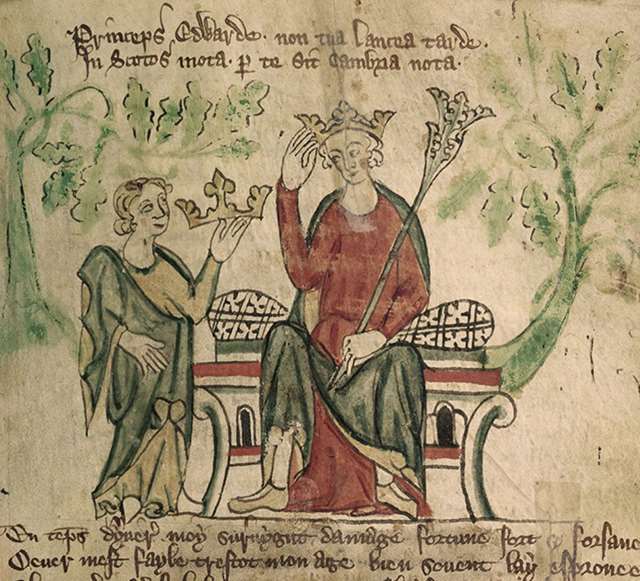 Edward I had asserted English dominance over much of Scotland. It’s kings, first Balliol then Bruce, had accepted (initially in the case of the latter), that England had overlordship. Yet, rebellions had taken place and Scottish lords continued to press for independence. Famously this had seen Wallace take the fight to the English before becoming a martyr to the cause. Now, Bruce was king. His brother was besieging Stirling Castle to wrestle it from the English. Neither Edward II or the barons could ignore the siege at Stirling Castle. To do so would be to hand back to the Scots most of the lands and power that had been won under Edward Longshanks. An army was assembled and led north by Edward II with several senior nobles. The Battle of Bannockburn was a long affair. Few Medieval battles lasted more than one day. Bannockburn lasted until the end of the second day. The Battle became a political and military disaster for Edward II and the English. English forces were made to break ranks during the second day of fighting. They had become hemmed in and unable to fight. The King and his bodyguard of around 500 knights left the battlefield on the advise of senior soldiers. Others fled. Those in formation were encircled and crushed. Those who broke free were chased down and killed. Accounts vary on numbers of dead. The English probably lost over 10000 men. 700 of the Men-at-Arms are believed to have been killed with a further 500 being held as prisoners. On the Scottish side, only 2 men of that rank are believed to have perished at Bannockburn. Edward II’s army was in tatters. There was no effective force for the defence of the North of England. It was impossible to stop Scottish raids in the coming years. England and Scotland drew up a peace settlement. It was a victory for Robert Bruce. The English recognised his right, and the right of his ancestors, to rule over Scotland. Edward’s humiliation at Bannockburn strengthened the position of leading baron, Thomas of Lancaster. As the senior noble, he was effectively ruling the country for 6 years after Bannockburn. Edward II though, was not willing to accept the demands of this baron. He again turned to favourites, this time promoting the Despensers. This led to a short baronial war. He defeated Thomas of Lancaster, captured him and had him executed. Edward II’s court was in turmoil at this point. The most powerful noble in the land had been executed. Others had died at Bannockburn. There was little faith in Edward as a leader. Edward’s favourites consolidated their positions. Edward, presumably knowing that there was unrest among the nobles, sent his wife to France as an ambassador. If the sending of Isabella to France was an attempt by Edward to gain support, it backfired. Instead, his Queen met with exiled nobles. Queen Isabella formed a bond with Roger Mortimer, one of the exiles. An invasion force was put together and landed in England. Isabella’s forces reached her husband in September 1326. There was no battle. Edward II was deposed. For centuries it accepted that he had been murdered at Berkeley Castle by men acting on the orders of Isabella, Mortimer and other barons. Rumours about the nature of his demise have circulated, based on his love of favourites. This belief is based on statements made at the time and the coronation of Edward III in January of 1327. In recent years the assumption that he was murdered has been challenged. Either way, his reign was over in real terms upon the arrival of Isabella and Mortimer. This was confirmed by the crowning of Edward III. History Extra – Was Edward II really murdered? 2 prominent historians debate the issue. English Heritage – feature looking at Edward II, Gaveson and Despenser. BBC – Biography of Edward II.